Worlds collide on Day 6 of the 13 Days of Halloween with Simply B Stamps! Well, maybe that's a bit over-dramatic but two holidays certainly do! Think Nightmare Before Christmas as Halloween and Christmas collide in "one jingle brained bag of fun"! We were instructed to make a Christmas treat box or bag. (No cards or layouts were allowed for this challenge.) And we had to "creep it out"! I decided to work with Draco the Ghost from the original Halloween Steampunks collection. His debonaire and dashing Victorian attire made me think of A Christmas Carol. He is colored with Copics and fussy cut. Papers are My Mind's Eye - Christmas. I used foam squares to pop him up on top of a Spellbinders Labels Ten die that I embossed in the Swiss Dots folder. 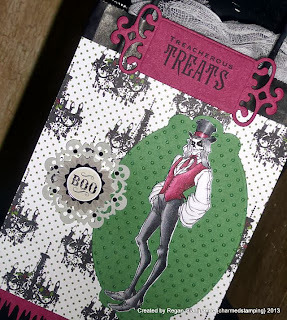 The sentiment from Waltzingmouse Stamps' Midnight Feast set was inked on one of the Spellbinders Fancy Tags and also popped up. I also added a large doily medallion from Jolee's Boutique and some gorgeous black and white ribbon. Cheese cloth in lieu of tissue paper enhances the creep factor. We had a super fun time at the Great Pumpkin Fest tonight! Take a look! It was really cool to see our jack o'lanterns out on display. The Cyclops came home with us, but sadly the cat suffered some sort of mishap and was not salvageable. Though it was fun to make something for Christmas, er, Creepmas, I'm not done celebrating Halloween yet! Just wait until you see what we're up to next weekend! And speaking of Christmas, stay tuned tomorrow for a brand new creation and a GDT spot that I am over the moon about! Until then... I'm off to bed! This is completely fabulous!!!! Thanks for joining in at SBS! Incredibly awesome job. Love it. Thanks for joining in with the 13 Days of Halloween at SBS. such an elegant and lovely treat bag!